Choosing a suitable pressure vessel design is critical to equipment operation. Lube-Power is a custom, engineer-to-order pressure vessel and console manufacturer. Lube-Power’s attention to detail and craftsmanship ensures you get the most value for your dollar and puts us ahead of the competition. Lube-Power holds certifications and stamps for Pressure Vessels (U) and Miniature Pressure Vessels (UM) per ASME Section VIII, Division 1. Lube-Power is also certified for metallic repairs and alterations (R) at our facility and in the field as authorized by the National Board Inspection code and NB-115 Accreditation of “R” Repair Organizations. These certificates are issued by the ASME Boiler and Pressure Vessel Code for the design, fabrication, inspection, testing, repair and certification of pressure vessels. Custom pressure vessels fabricated by Lube-Power are used to protect rotating equipment by maintaining pressure and/or flow during unexpected operating conditions; such as coast down, transients, or power outages. In addition, Lube-Power can customize un-pressurized storage tanks/reservoirs to fit any application, large or small! Whether it be grade mounted pressurized rundown tanks, overhead gravity fed rundown tanks, seal-oil over head tanks, direct contact accumulators, un-pressurized storage tanks, etc., you can count on Lube-Power to engineer a product designed to meet the applicable specifications and ISO/API standards of each project. Read more on Lube Power's Pressure Vessels. Lube-Power’s standard offering includes engineering and design services to prepare code calculations, CAD drawings and construction requirements to meet any specific fabrication needs. 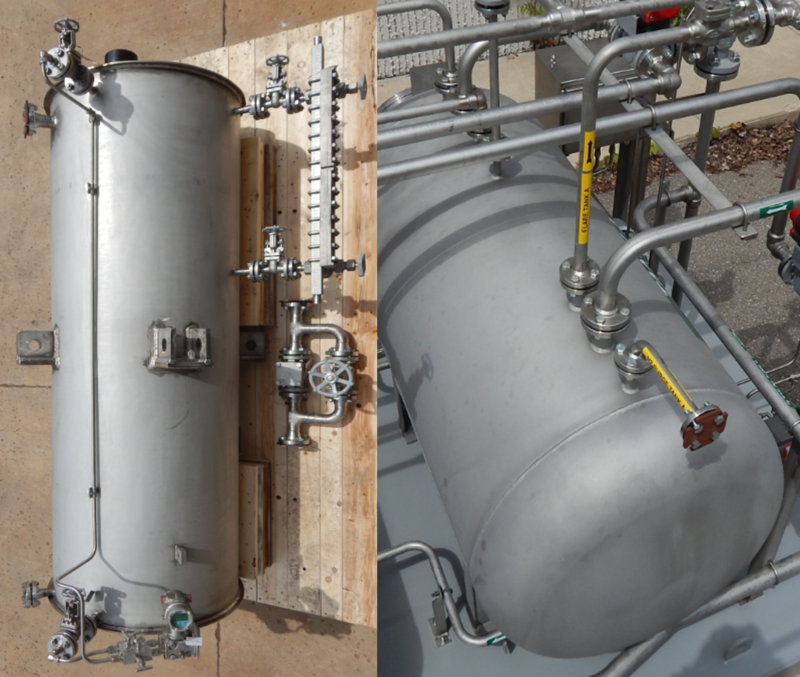 LPI’s engineering, design and fabrication teams can also work from client provided drawings, designs and photos to retrofit or refurbish existing pressurized vessels and storage tanks. Read more on the predicted growth in the automatic lubrication system market.